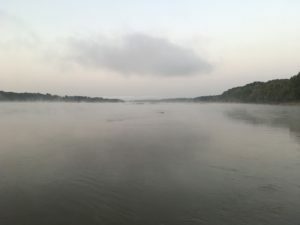 The fog was thick when we awoke at Hoppies, but by the time we checked our options, charted our maps, looked at the weather apps and had our oatmeal and juice – the fog lifted and we had a beautiful sunrise for our departure. 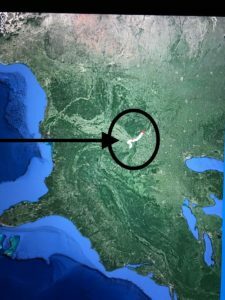 Reminder – The Mississippi trash was abundant! 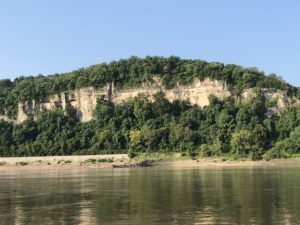 We made such good time we decided to go all the way to Paducah, Kentucky – we could make it there by 4:00 “if all goes well”. 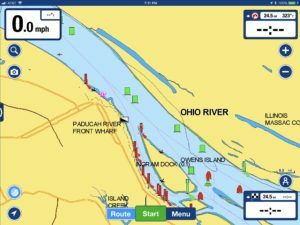 At Cairo we made a hard port turn (left) and into the Ohio River and against the current – which slowed us down by at least 3-4 mph. 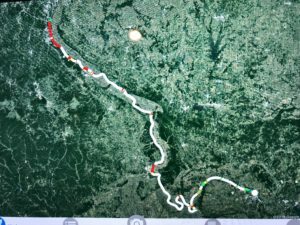 We tracked our travels on “Nebo”…. ….told the grand-kids we got run over by a train…. The first lock let us right through without even securing a line. The current was pushing us around but we managed thorough. 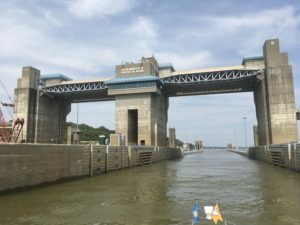 The second lock was only 4 miles from where we would dock in Paducah. 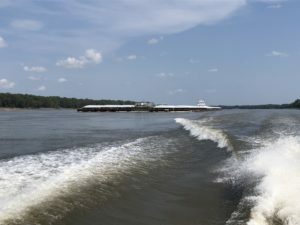 The lock master had us go to the “Kentucky side” of the river and anchor while he let several tows and barges go down. 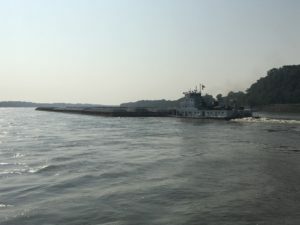 Each barge takes about 45 minutes to an hour. 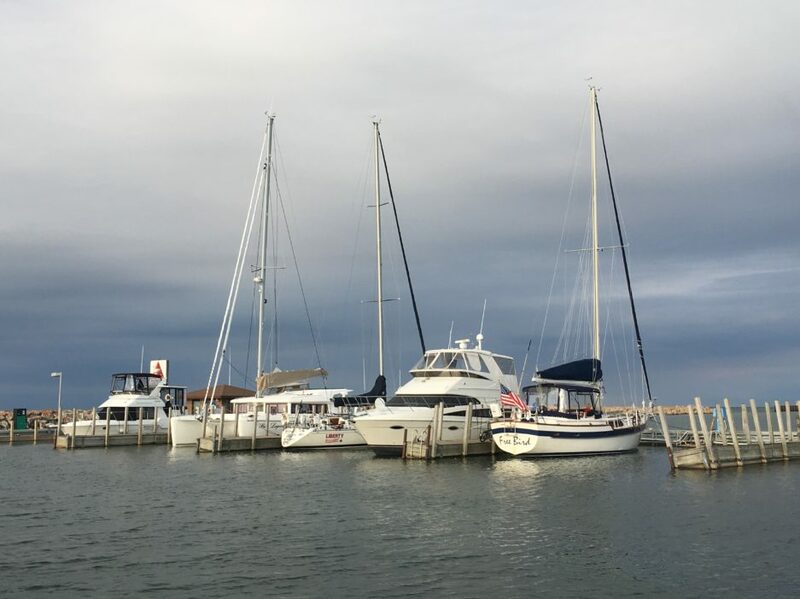 We anchored, made barbecue sandwiches and potato salad, and made the best of it. 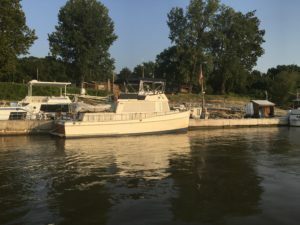 Here we sat – anchored out – just yards from the lock and a few miles from our dock for the night in Paducah, Kentucky. And here we sat for over three hours. 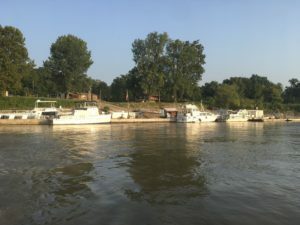 It was beginning to get dark and we were starting to get nervous when the lock master finally hailed us on the radio that we could enter the lock – “Pleasure boat Kara Mia, this is Lock 52, please proceed to the locking chamber – pull around barge Miss Lucy on your starboard and enter slowly”. 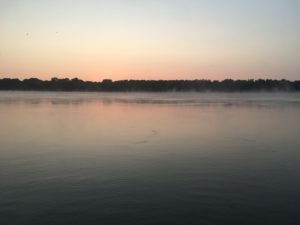 We locked through and ultimately arrived at the the Paducah City Docks before dark. Today we traveled 206 miles and 12.5 hours. On an average day we travel 40-50 miles. We left Hoppies in Missouri at 7:30 am and arrived in Paducah, Kentucky at 8:00 pm. It was our longest travel day of our 7,000+ mile trip so far!